Sketching people in the waiting room is a crap shoot. One never knows when the subject will be called into the inner sanctum. Therefore one must draw the essential elements as quickly as possible, for example, the angle of the elbow; tilt of the head; the distribution of weight and so on.Static details such as the surrounding environment can be filled in later. The scene below contains three separate portraits. I was hoping for more people to sketch, but I was called to the office before anyone else came. 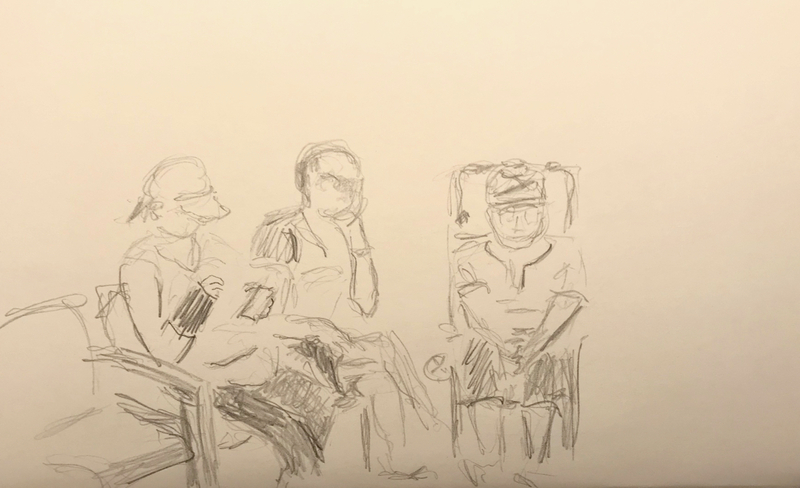 This entry was posted in Personal Stories and tagged 15 minute sketch, art, artistic process, gesture, pencil sketch, portrait, sketch, visual art, visual element, Waiting Room. Bookmark the permalink.